End's Season with 2 Championships and a 3rd place! Updated Wednesday August 2, 2017 by Nick Dreher. The Saxonburg 9u team participated in the Braun Jeffrey 10u Tournament this past weekend. The team utilized two 10 year old call up's in the tournament to fill vacant holes. The team finished in 3rd place out of the 8 teams beating the Reserve 10u team in the consolation game on Monday. The tournament handed out MVP honors to one kid on every team with Noah Glassic receiving Saxonburg's as selected by his coaches. Noah batted over .800 in the tournament, made several nice catches in the tournament playing Right Center Field as well as pitched very well. 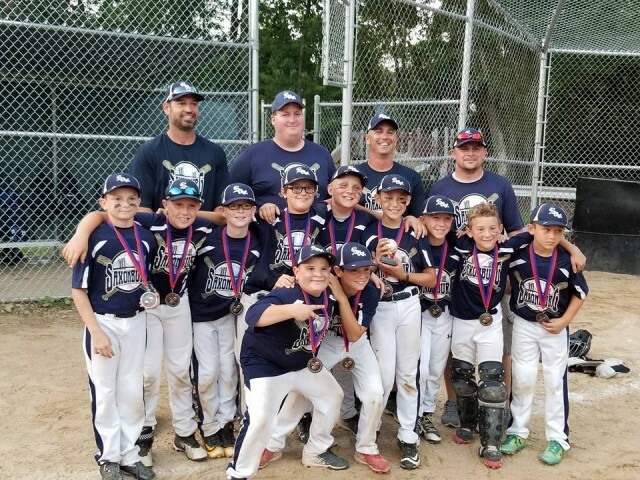 This tournament ended the 9u Travel teams tournament season with the team winning 2 Championships (Saxonburg and Freeport) as well as getting 3rd at Braun Jeffrey's in the 5 tournaments entered. Many thanks to the players, coaches, parents and siblings for a great season! Special thank you to Ben and Erika Allison for all their hard work coaching, communicating, and doing everything necessary for an successful season.